How does the need for early childhood programs — particularly for home visiting and preschool education — align with access to and use of such services across New Hampshire? What types of early childhood programs are available in four focal communities that are already making advances in this area? What strategies are these communities using, and what challenges do they face? What strategic approach can New Hampshire take to increase investment in evidence-based early childhood programs? A substantial share of children in New Hampshire are at risk of adverse developmental outcomes because of low family resources and other factors that can compromise healthy development in the first few years of life. This report examines the need for early childhood investments in communities across New Hampshire, the current investments under way and how they match with underlying needs, and where there are opportunities for further strategic investments in early childhood programs, particularly home visiting and preschool education. Drawing on data that characterize the variation in needs and services across the state and a study of four focal communities that are already making advances in this area, the author recommends a strategic approach to further investments in early childhood programs, focusing first on those communities with the greatest need but with current low rates of access. There is tremendous variability across New Hampshire communities in the extent to which the state's youngest children and their families face various risks and stressors that can compromise healthy child development. Family Resource Centers (FRCs) in many communities in New Hampshire implement home visiting as part of a larger set of comprehensive family support services. Home visiting programs serve up to 1,100 families and children each year, far below the estimated 9,200 who would be expected to benefit. Further work is needed to map where the gap in home visiting services relative to need is greatest. There is little information about the nature and quality of school district preschool programs, which reach about 4,000 children annually, both children with special needs and their typically developing peers. Information from the districts in four focal communities — Claremont, Manchester, Nashua, and Coös County — shows that most of their preschool enrollment is in part-day and part-week programs, with teacher qualifications, class sizes, and teacher-child ratios consistent with high quality. Access to district preschool programs is not aligned with the districts where children are most at risk of poor academic performance because of high rates of poverty and other disadvantages. To maximize the expected return, expand evidence-based home visiting and preschool programs in a strategic fashion. Strategic investments should involve state and local public funds, as well as private contributions from philanthropy and business, to (1) expand access to high-quality evidence-based home visiting and preschool programs, starting in those communities with the greatest access gaps; (2) continue strategies to realize an effective and efficient integrated early childhood system; and (3) build the data systems and other infrastructure at the state level to support informed decisions about future investments and to ensure that quality is achieved and expected impacts are realized. This research was funded by the Endowment for Health, the New Hampshire Charitable Foundation and its Neil and Louise Tillotson Fund, and the New Hampshire Children's Health Foundation and conducted by RAND Education and Labor. 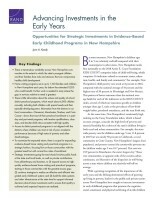 Karoly, Lynn A., Advancing Investments in the Early Years: Opportunities for Strategic Investments in Evidence-Based Early Childhood Programs in New Hampshire. Santa Monica, CA: RAND Corporation, 2019. https://www.rand.org/pubs/research_reports/RR2955.html.